← Petition Continues to Rocket upward – 4001 signatures and counting! We were contacted by the Evening News about the possibility of The Fields in Trust‘s involvement with safeguarding a piece of land at Craighouse. As we say in the article, whilst we welcome any means of protecting the site it is important that the site is not salami-sliced with one part’s protection buying development of the rest. You can read the full Evening News article about this here. We would also like to make it clear that the Friends have not been party to any discussion about this, nor have we been “offered” any stretch of land. We have invited Jenny Dawe to accompany us on a site visit which she has accepted and we look forward to finding out more about this particular issue then. The site tour is the brainchild of Graham Cameron who has been tirelessly leading politicians, community councils and other interested bodies around the site without anything more than the Craighouse Partnership’s own map (available on their website) for reference. Johnstone and candidate for Meadows and Morningside, Melanie Main (pictured above); Labour Councillor for Craiglockhart and Fountainbridge, Andrew Burns (pictured right); Conservative Councillor Mark McInnes (pictured left) and Will Searle, Conservative candidate for Craiglockhart and Fountainbridge. We would like to thank them all for taking the time to and for their penetrating questions. We have already received a number of quotes (click on pictures to read) and we will be posting more in due course. 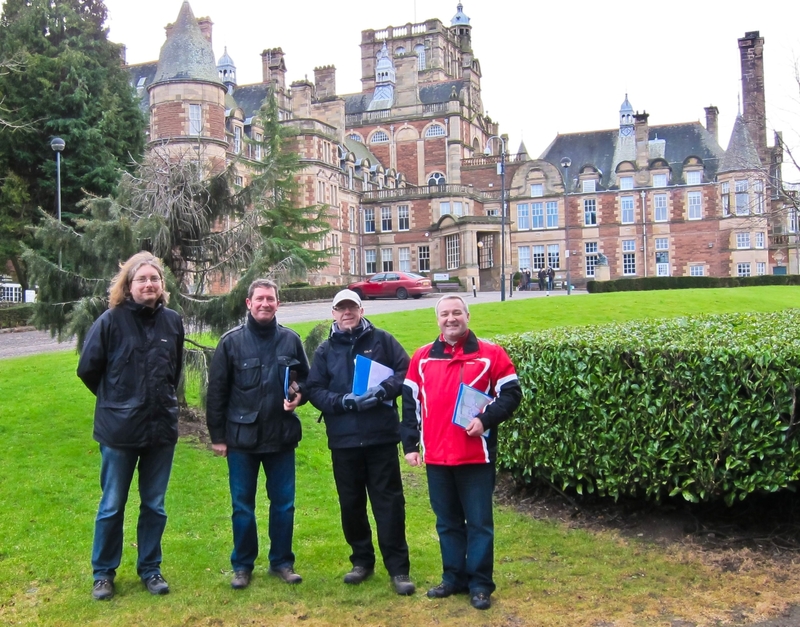 SNP MSP Jim Eadie also undertook a lengthy tour and this weekend, we were delighted to introduce SNP candidate for Craiglockhart and Fountainbridge, David Key, and Sandy Howat for Meadows and Morningside (pictured left)to this fabulous site. We will be posting their quotes shortly. We would also like to thank community councillors, Goff Cantley, Alan Dixon, Mairianna Clyde, John Lennie, Tom Crombie and Bryce Morrison for also attending a tour late last year (click for more here). Most of all our heartfelt thanks must go to tour master, Graham! What becomes clear when you go on this tour is those parts of the development many have not noticed yet. Buildings around the listed buildings, for example, that look relatively insignificant on the Craighouse Partnership’s map are – you realise when looking at the site on the ground – absolutely huge imposing three and four storey blocks and larger than many of their historic neighbours. It is clear that the development off Craighouse Road will be a huge restriction of access and block most of the traditional views of Old Craig – the most important and oldest building on the site. Not to mention adding an unworkable strain on a local road network that is flimsy already. And it is crystal clear that if a road is allowed past the sleepy retirement flats on the quiet cul-de-sac of Craiglea Place, then it carves a straight access road up to Craighouse Wood. Would this be the next target on the developers’ shopping list, I wonder? However well you feel you know the site, we would encourage everyone to take a map and work out the size and situation of the development sites for themselves: it is most revealing. And we would like to extend an invitation to any interested organisations that would like come on one of our tours to contact us.